Camber is not adjustable. If the measurement is not within the specified range, inspect the suspension parts for damage and/or wear, and replace them if necessary. If the toe-in is not within the specified range, adjust it at the rear No. 2 suspension arms. (a) Measure the lengths of the right and left rear No. 2 suspension arms. If the left-right difference is larger than 1.5 mm (0.0590 in. ), adjust it by following the procedures below. 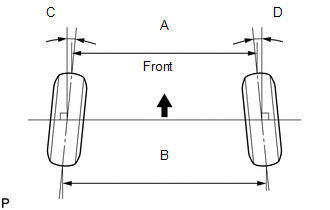 (c) If the length difference between the left and right rear No. 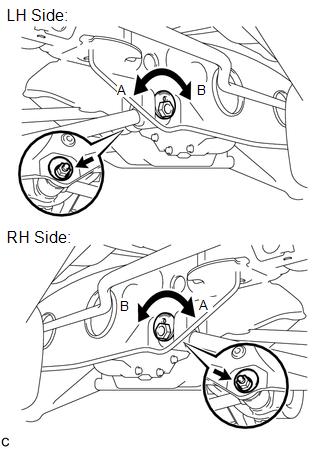 2 suspension arm assemblies is not within the specified range, adjust it by following the procedures below. (1) If the toe-in measurement is greater than the specified range, extend the shorter rear No. 2 suspension arm assembly by rotating the adjusting tube in the direction of arrow B in the illustration. (2) If the toe-in measurement is less than the specified range, shorten the longer rear No. 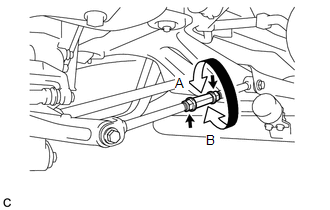 2 suspension arm assembly by rotating the adjusting tube in the direction of arrow A in the illustration. (d) Turn the right and left adjusting tubes by an equal amount to adjust toe-in. Try to adjust the toe-in to the center of the specified range. One turn of each adjusting tube will adjust the toe-in by approximately 11.1 mm (0.437 in.). Tighten the outside lock nut. Tighten the inside lock nut. Retighten the outside lock nut. (a) Measure the distance between each wheel disc and the center of the toe-adjusting cam. If the left-right difference is larger than 1.0 mm (0.0393 in. ), adjust it by following the procedures below. (b) Loosen the toe-adjust cam set nuts. (c) If the distance between each wheel disc and the center of the toe-adjusting cam is not within the specified range, adjust it by following the procedures below. (1) If the toe-in measurement is greater than the specified range, extend the shorter rear No. 2 suspension arm assembly by rotating the adjust cams in the direction of arrow B in the illustration. (2) If the toe-in measurement is less than the specified range, shorten the longer rear No. 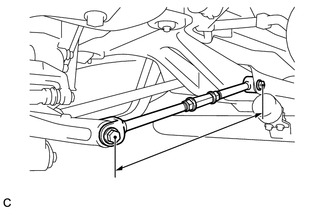 2 suspension arm assembly by rotating the adjust cams in the direction of arrow A in the illustration. (d) Turn the adjust cams by an equal amount to adjust toe-in. One graduation of each adjusting cam will adjust the toe-in by approximately 3.3 mm (0.130 in.). (e) Tighten the toe-adjust cam set nuts.